In the last several months, I have become involved with helping the homeless network in Waterbury, CT. Brian Gibbons, longtime friend and director of the state-run Homeless Outreach Network, leads a group of helpers and volunteers to provide items to help the often-forgotten homeless of Waterbury – living in the woods in tents or in abandoned buildings. I took a tour of these places, and met a number of the people living in them. It is rough. 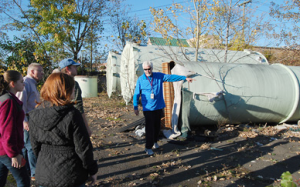 There are anywhere between 20 and 50 people actively living outside in the Waterbury area at any given time, and their needs are many. This website has some imagery of these living conditions and some of the volunteers that help, through another great organization, Brass City Harvest. The network helps provide the people with their basic needs: food, water, clothing, footwear, and basic toiletry items. In the winter, the network moves into high gear, placing each of these people in apartments and motel rooms on the coldest, most dangerous nights. Obviously, it takes many generous hands to make this happen. The volunteers are many, but supplies are often short. My homepage has options for purchasing music or donating outright to support this mission. I hope you’ll take advantage. 50% of the online music purchases, and every penny of the donations will go straight to these people’s needs, in the way of small-denomination gift cards to Walmart and grocery stores, as well as purchasing shoes and other basic necessities. Click here to see the options: www.scottlamlein.com. It’s a gift to me to be able to share my music in a way that makes a difference. Thanks in advance for your support.